If you're new to Stampin' Up! or simply pressed for time, nothing will get you started faster than the Simply Sent Card Kits. 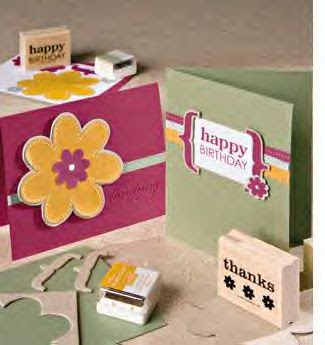 These kits offer a fast and easy way to create cards for a variety of occasions. The die-cut rubber stamps, precut materials and step-by-step instructions will help you start stamping beautiful projects in seconds, and from October 4-8, you can order all of the Simply Sent Card Kits for 20 percent off their regular price! Call or email me today to order your Simply Sent Card Kits at 20% off!